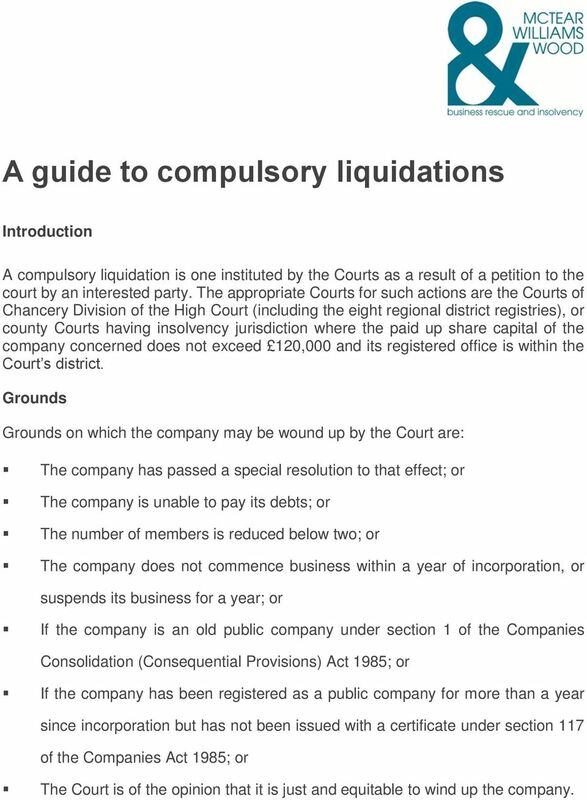 Download "A guide to compulsory liquidations"
1 A guide to compulsory liquidations Introduction A compulsory liquidation is one instituted by the Courts as a result of a petition to the court by an interested party. The appropriate Courts for such actions are the Courts of Chancery Division of the High Court (including the eight regional district registries), or county Courts having insolvency jurisdiction where the paid up share capital of the company concerned does not exceed 120,000 and its registered office is within the Court s district. Grounds Grounds on which the company may be wound up by the Court are: The company has passed a special resolution to that effect; or The company is unable to pay its debts; or The number of members is reduced below two; or The company does not commence business within a year of incorporation, or suspends its business for a year; or If the company is an old public company under section 1 of the Companies Consolidation (Consequential Provisions) Act 1985; or If the company has been registered as a public company for more than a year since incorporation but has not been issued with a certificate under section 117 of the Companies Act 1985; or The Court is of the opinion that it is just and equitable to wind up the company. 2 Petition A petition may be presented by the company, the directors, a creditor or a contributory. Contributory means every person liable to contribute to the assets of a company on winding up, including those claiming to be contributories prior to determination of such claims. A contributory may normally petition only if the number of members has been reduced below two, or if he had acquired shares by allotment or as a result of the death of a previous shareholder, or if he has been a member for at least six months in the previous 18 months. However, a person who is a contributory by virtue of being a party to the redemption or purchase of the company s shares may petition on the grounds that the company is unable to pay its debts, or that it is just and equitable that the company should be liquidated. An administrator or administrative receiver has the power to present a petition for the winding up of certain companies including the Secretary of State for Trade and Industry, the Official Receiver and the Bank of England. The most common form of petition is by a creditor on the grounds that the company is unable to pay its debts. Whilst the Court may determine whether a company is unable to pay its debts, a company is deemed to be in this position if an execution of a judgement debt is unsatisfied, or if the company fails to pay a statutory demand. It is sufficient for a creditor for a debt exceeding 750 to serve a demand for payment at the company s registered office; if the debt is not disputed, the failure to pay within three weeks will constitute inability by the company to pay its debts for this purpose. At the time the petition is presented to the Court a date for a hearing is fixed and the petition must then be served at the company s registered office unless the petitioner is the company. The petition has to be advertised in the London Gazette not less than seven business days after it has been served and not less than seven business days before the date of the hearing. 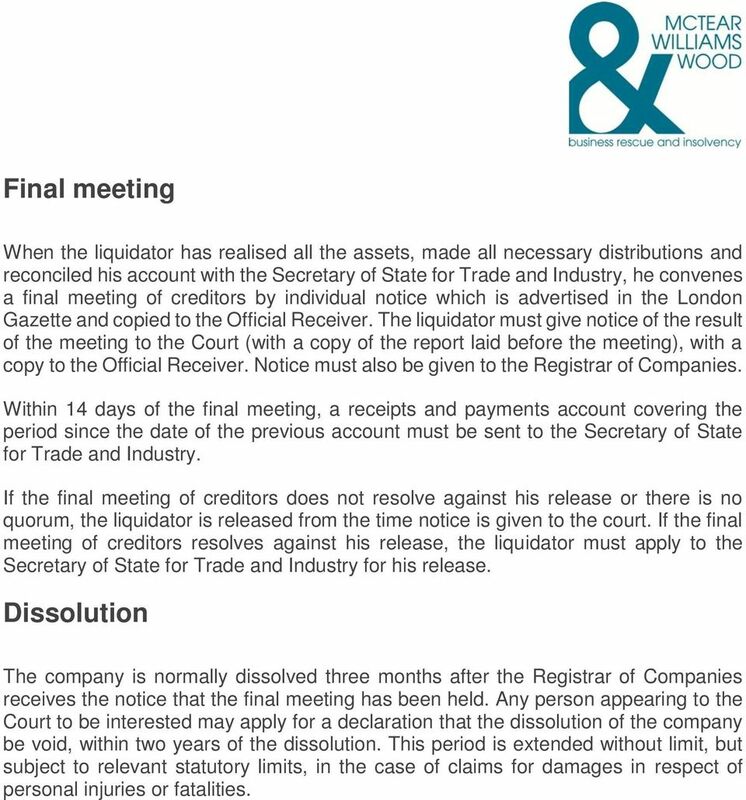 Provisional liquidator Circumstances may arise in which it is necessary for action to be taken in respect of a company s assets or business in the period after the presentation of the petition but before the hearing, and the Court has the power to appoint a provisional liquidator during this period. Such an appointment may be made upon application of the company, a creditor, or a contributory. If the provisional liquidator is an insolvency practitioner he must file a bond, to cover the value of the assets, in Court. Where the Official Receiver has been appointed provisional liquidator (or liquidator after a winding-up order) he may consider that the nature of the company s assets or business is such that a manager is required to administer the estate and he may apply to the Court for the appointment of a special manager, who will be given specific powers by the Court. Further more in the interim period, the company, a creditor or a contributory may apply to the Court for any proceedings being taken against the company to be stayed. 3 Winding-up order When the petition is heard, the Court may grant the petition by making a winding-up order or dismiss it, adjourn the hearing or make any interim order or other order that it thinks fit. 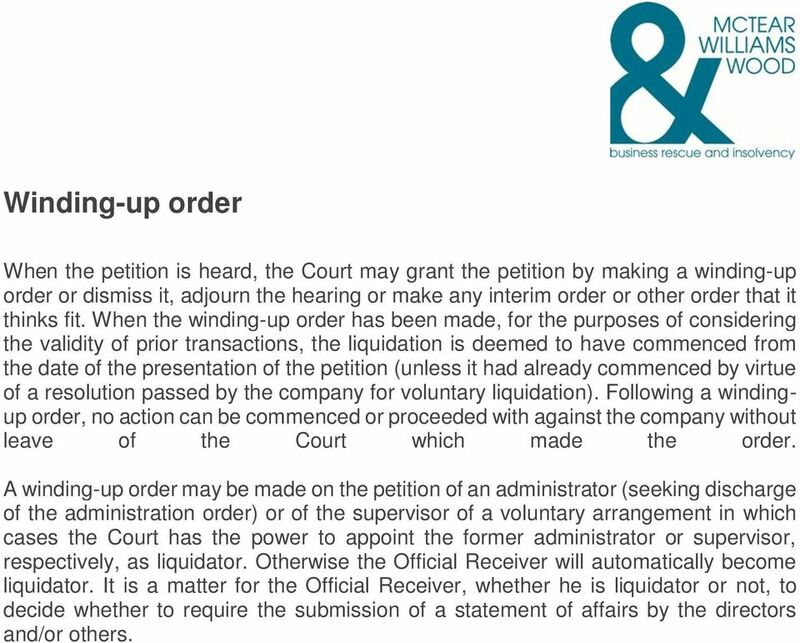 When the winding-up order has been made, for the purposes of considering the validity of prior transactions, the liquidation is deemed to have commenced from the date of the presentation of the petition (unless it had already commenced by virtue of a resolution passed by the company for voluntary liquidation). Following a windingup order, no action can be commenced or proceeded with against the company without leave of the Court which made the order. A winding-up order may be made on the petition of an administrator (seeking discharge of the administration order) or of the supervisor of a voluntary arrangement in which cases the Court has the power to appoint the former administrator or supervisor, respectively, as liquidator. Otherwise the Official Receiver will automatically become liquidator. It is a matter for the Official Receiver, whether he is liquidator or not, to decide whether to require the submission of a statement of affairs by the directors and/or others. 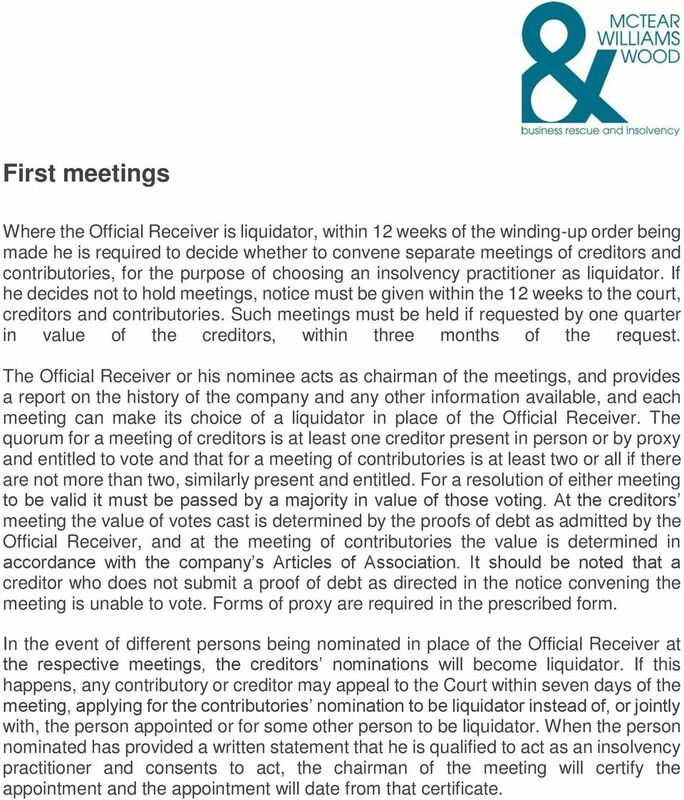 4 First meetings Where the Official Receiver is liquidator, within 12 weeks of the winding-up order being made he is required to decide whether to convene separate meetings of creditors and contributories, for the purpose of choosing an insolvency practitioner as liquidator. If he decides not to hold meetings, notice must be given within the 12 weeks to the court, creditors and contributories. Such meetings must be held if requested by one quarter in value of the creditors, within three months of the request. The Official Receiver or his nominee acts as chairman of the meetings, and provides a report on the history of the company and any other information available, and each meeting can make its choice of a liquidator in place of the Official Receiver. The quorum for a meeting of creditors is at least one creditor present in person or by proxy and entitled to vote and that for a meeting of contributories is at least two or all if there are not more than two, similarly present and entitled. For a resolution of either meeting to be valid it must be passed by a majority in value of those voting. At the creditors meeting the value of votes cast is determined by the proofs of debt as admitted by the Official Receiver, and at the meeting of contributories the value is determined in accordance with the company s Articles of Association. It should be noted that a creditor who does not submit a proof of debt as directed in the notice convening the meeting is unable to vote. Forms of proxy are required in the prescribed form. In the event of different persons being nominated in place of the Official Receiver at the respective meetings, the creditors nominations will become liquidator. If this happens, any contributory or creditor may appeal to the Court within seven days of the meeting, applying for the contributories nomination to be liquidator instead of, or jointly with, the person appointed or for some other person to be liquidator. When the person nominated has provided a written statement that he is qualified to act as an insolvency practitioner and consents to act, the chairman of the meeting will certify the appointment and the appointment will date from that certificate. 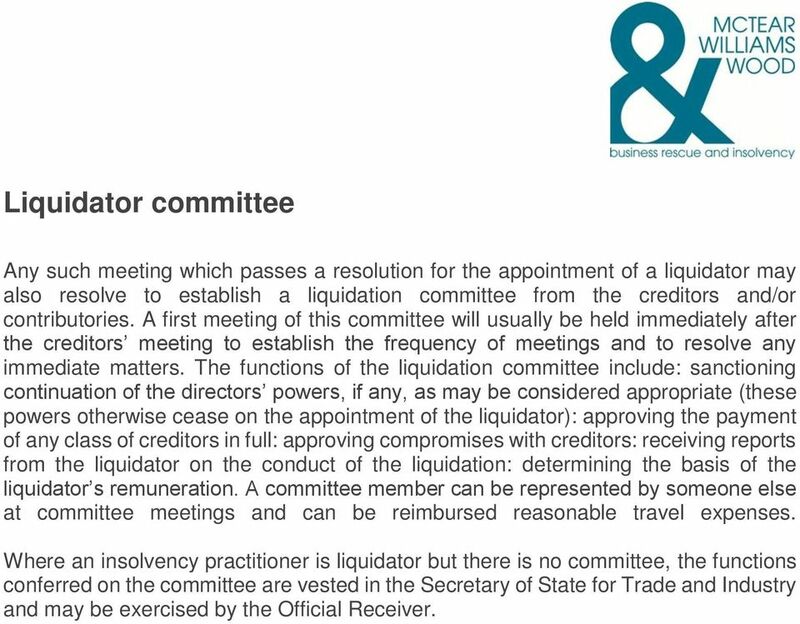 5 Liquidator committee Any such meeting which passes a resolution for the appointment of a liquidator may also resolve to establish a liquidation committee from the creditors and/or contributories. A first meeting of this committee will usually be held immediately after the creditors meeting to establish the frequency of meetings and to resolve any immediate matters. The functions of the liquidation committee include: sanctioning continuation of the directors powers, if any, as may be considered appropriate (these powers otherwise cease on the appointment of the liquidator): approving the payment of any class of creditors in full: approving compromises with creditors: receiving reports from the liquidator on the conduct of the liquidation: determining the basis of the liquidator s remuneration. A committee member can be represented by someone else at committee meetings and can be reimbursed reasonable travel expenses. Where an insolvency practitioner is liquidator but there is no committee, the functions conferred on the committee are vested in the Secretary of State for Trade and Industry and may be exercised by the Official Receiver. 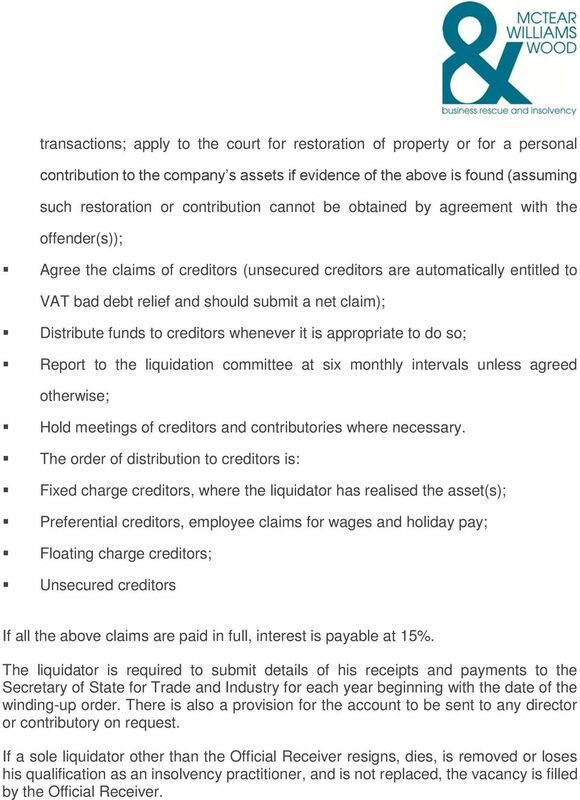 7 transactions; apply to the court for restoration of property or for a personal contribution to the company s assets if evidence of the above is found (assuming such restoration or contribution cannot be obtained by agreement with the offender(s)); Agree the claims of creditors (unsecured creditors are automatically entitled to VAT bad debt relief and should submit a net claim); Distribute funds to creditors whenever it is appropriate to do so; Report to the liquidation committee at six monthly intervals unless agreed otherwise; Hold meetings of creditors and contributories where necessary. The order of distribution to creditors is: Fixed charge creditors, where the liquidator has realised the asset(s); Preferential creditors, employee claims for wages and holiday pay; Floating charge creditors; Unsecured creditors If all the above claims are paid in full, interest is payable at 15%. The liquidator is required to submit details of his receipts and payments to the Secretary of State for Trade and Industry for each year beginning with the date of the winding-up order. There is also a provision for the account to be sent to any director or contributory on request. If a sole liquidator other than the Official Receiver resigns, dies, is removed or loses his qualification as an insolvency practitioner, and is not replaced, the vacancy is filled by the Official Receiver. 8 Final meeting When the liquidator has realised all the assets, made all necessary distributions and reconciled his account with the Secretary of State for Trade and Industry, he convenes a final meeting of creditors by individual notice which is advertised in the London Gazette and copied to the Official Receiver. The liquidator must give notice of the result of the meeting to the Court (with a copy of the report laid before the meeting), with a copy to the Official Receiver. Notice must also be given to the Registrar of Companies. Within 14 days of the final meeting, a receipts and payments account covering the period since the date of the previous account must be sent to the Secretary of State for Trade and Industry. If the final meeting of creditors does not resolve against his release or there is no quorum, the liquidator is released from the time notice is given to the court. If the final meeting of creditors resolves against his release, the liquidator must apply to the Secretary of State for Trade and Industry for his release. Dissolution The company is normally dissolved three months after the Registrar of Companies receives the notice that the final meeting has been held. Any person appearing to the Court to be interested may apply for a declaration that the dissolution of the company be void, within two years of the dissolution. This period is extended without limit, but subject to relevant statutory limits, in the case of claims for damages in respect of personal injuries or fatalities. Corporate Insolvency in Ireland Dillon Eustace Table of Contents Page 1. Mechanisms of Corporate Insolvency 1 2. Liquidation 1 3. Functions of the Liquidator 2 4. 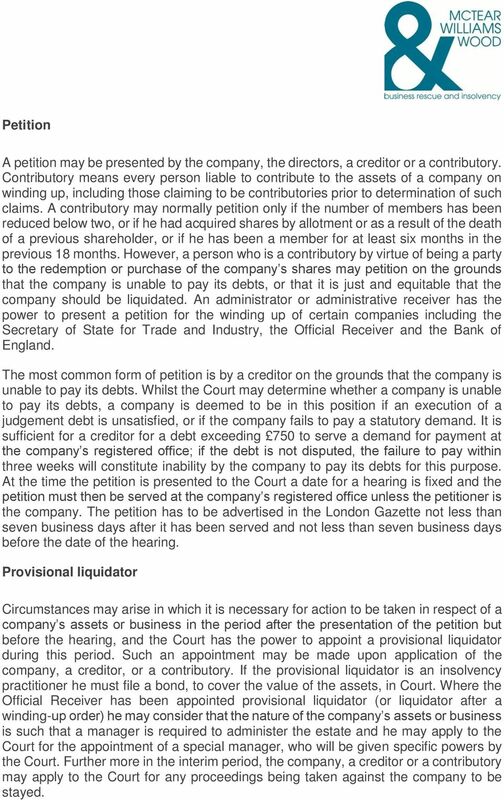 Liquidation and Creditors Rights 2 5. Glossary of terms. Bond Quasi fidelity insurance needed by a person who acts as an insolvency practitioner. Liquidator in Creditors Voluntary Liquidation Liquidator in Compulsory Liquidation Provisional Supervisor. Status. Officer of the court. 立 法 會 Legislative Council Paper for the House Committee Meeting on 16 October 2015 Legal Service Division Report on Companies (Winding Up and Miscellaneous Provisions) (Amendment) Bill 2015 LC Paper No. PENA LIMITED HONG KONG COMPANY SECRETARY TARIFFS I. COMPANY INCORPORATION BASIC PACKAGE II. SHELF READY MADE COMPANY PACKAGE III. SHELF READY MADE COMPANY ON DEMAND IV. COMPANY SECRETARIAL SERVICES V.
In the course of professional practice, practitioners may encounter instances where a solvent company is no longer required by its directors and members. Examples may include: A company is not operating. SIP9 Guide to Liquidators Fees (E & W) A CREDITORS GUIDE TO LIQUIDATORS FEES ENGLAND AND WALES 1 Introduction 1.1 When a company goes into liquidation the costs of the proceedings are paid out of its assets. At the EGM, the shareholders decide to put the company into liquidation and vote for the insolvency practitioner that they wish to be appointed. 2.4 Where a court liquidation follows immediately on an administration the court may appoint the former administrator to act as liquidator. 1. Introduction 2. 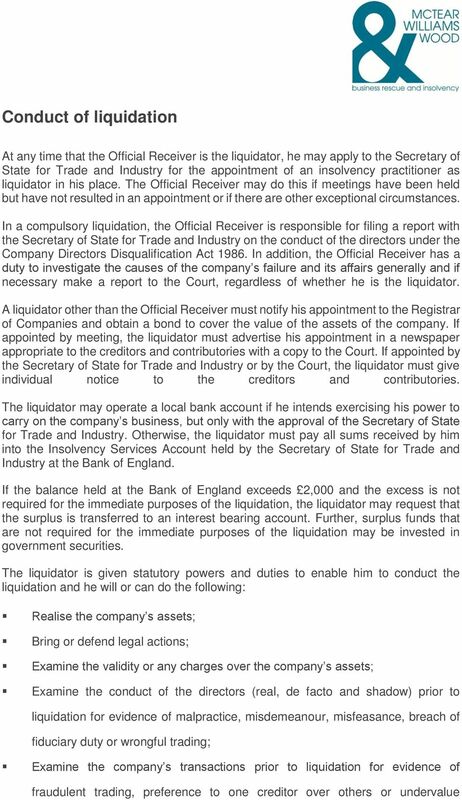 The Liquidation Procedure 3. The Liquidation Committee 4. Fixing the Liquidator's Fees 5. What Information Should be Provided by the Liquidator? 6. What if a Creditor is Dissatisfied? Cayman Islands Winding Up a Company Introduction This memorandum explains the procedure for both a compulsory and a voluntary winding up of a Cayman Islands' company, and sets out the duties of a liquidator. A guide to Liquidation Liquidation Regrettably, it is often not possible to sell a business, perhaps because the type of business is no longer viable or because the economic climate makes trading too difficult. STATEMENT OF INSOLVENCY PRACTICE GUIDANCE FOR MEMBERS OF THE COMMITTEE OF INSPECTION IN COURT AND IN CREDITORS VOLUNTARY LIQUIDATIONS.